Food is our common ground – a universal experience. Guided by a passion for art, Ryke’s Catering specializes in creating personalized experiences centered around uniquely prepared foods for a variety of events including weddings, intimate dining, corporate functions and themed events. We take a personal approach guiding you through each step to build the type of event you are looking for. 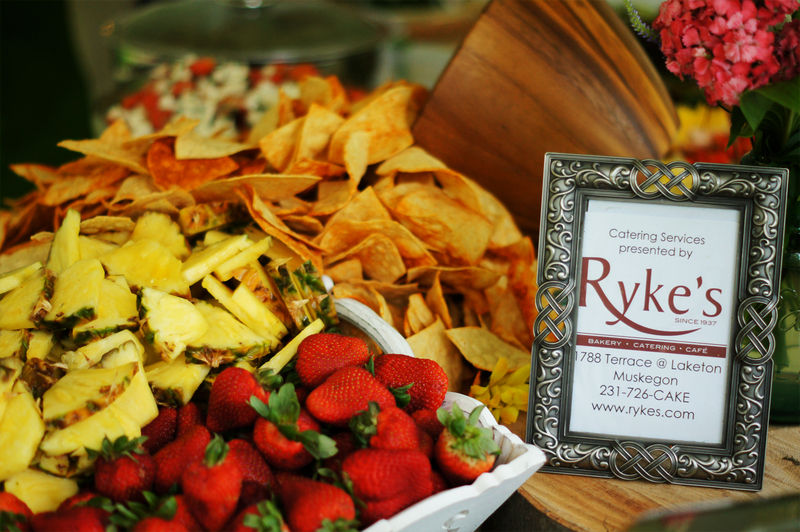 Ryke’s is perfect for all your catering needs. Whether you are entertaining eight or eight hundred, Chef Adam Bell and the Ryke’s Catering team can make your event everything you want it to be with versatile menus to meet your approval and budget. Take a look at our gallery to see some of the cuisine we’ve prepared for various events. 25% or $400 (whichever is greater) will secure your event. 30 days prior to your event, your Catering Planning Questionnaire is due. 10 days prior to your event your final guest count is due. 7 days prior to your event your final payment is due. Need help choosing an event location? What is the best way to contact you with questions or to place an order with you? Email – catering@rykes.com – is always best, as our chefs are frequently on the phones, producing for events, or off property, setting up and running events. Through email, we can ensure that your questions will be responded to in a timely fashion, as they can be handled when the chefs are available. Calls are also welcome. The Bakery is open from 6:30am - 5:30pm Monday through Friday and Saturdays & Sundays from 7:00am - 3:00pm. If a chef is unavailable to take your call, please leave a message. How far in advance should I place my catering order? Michigan’s “event” season begins May 1st and ends January 1st. If your event is planned during this time period, the more notice you can provide, the better. We typically start booking Saturday events during this time period a year to a year and a half in advance. Events are booked on a first come first served basis, so plan early. We can accommodate more limited menus for boxed or catered lunches with a minimum of 48 hours notice or the café menu is always available. Again, the earlier we are contacted, the better able we are to accommodate your specific menu requirements. Do you require payment or a deposit at the time of order? Yes, we do require a deposit to secure your event date. Deposits vary depending on the size and scope of your event. Your deposit is non-refundable and non-transferable. We accept all major credit cards but offer a discount for cash or checks. ALL quotes are based on payment with cash, check, or cashier’s check. The non-discounted price for credit or debit cards is an additional 3%. 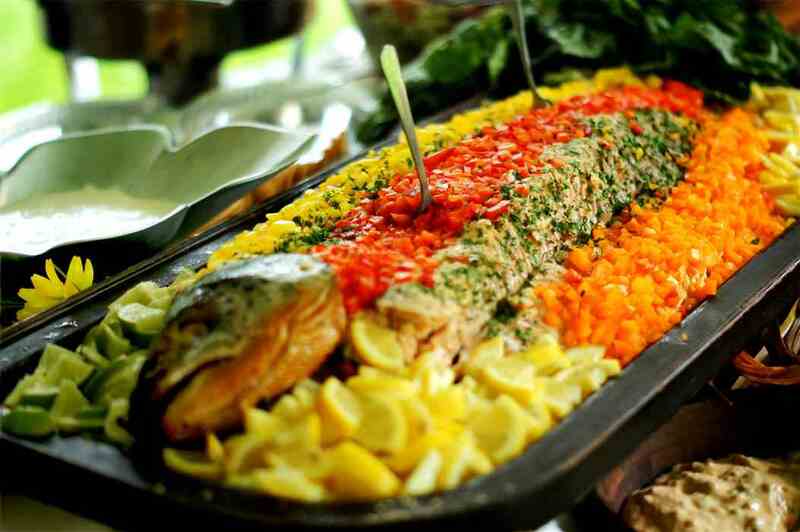 We will finalize your menu and review the event plan 30 days before your event. Your final guest count is requested 14 days before your event, and your final payment is due 7 days prior to your event. Your event cost is based on payment with cash, check, or cashier’s check. Credit or debit cards will be charged an additional 3%. A table layout and the Event Timing Worksheet must be received 30 days prior to your event. Final count is due 14 days before your event. Click here to fill out the Event Timing Worksheet. Your final payment is due 7 days prior to the event. We are always able to increase your guest count at this time but unable to decrease your count due to products that have been ordered. Yes, we offer tastings by appointment. The tasting consists of a variety of salads and appetizers that are offered in our café on a daily basis. The intent of the tasting is to give you a taste of how we use flavors to create a fabulous menu for you. The tasting is NOT designed for you to actually try out the menu you are planning for your event. Handling tastings this way enables you to get a feel for what we do and it enables us to keep prices lower for your event. Do you create custom menus? Yes, please contact Chef Adam (catering@rykes.com) to specifically design a menu that’s right for you. Do you offer discounts if we purchase our cake and catering through Ryke’s? Yes, we can offer a variety of vegetarian and vegan options. Do you charge cake-cutting fees? We offer cake-cutting as an option at $1.00 per serving. The $1.00 covers the cost of the plates, napkins, forks, servers, etc. We offer you the choice of utilizing this service so that you can be in control of your budget. Keep in mind that if you choose to cut the cake yourself, you will also need to provide the plates, forks, napkins, etc. Can you provide tables, chairs, linens and other rental items? We can offer linens. Ask for referrals to provide additional rental services. For corporate catering, do you accommodate last minute orders? We prefer 48 hours notice for all orders to ensure product availability. However, we will always do our best to accommodate last minute orders, so please contact us. Call the bakery during business hours: Monday-Friday, 6:30am-5:30pm and Saturdays & Sundays, 7:00am-3:00pm. Full payment is required at the time of order. If paying with EBT, please click here for more information. Two weeks notice is requested for all special orders; however, call us if needed sooner to discuss how we can accommodate your specific needs. Approval of product is requested at pick up. We are happy to fix anything you are not satisfied with, while at the bakery. We ask that you place your order by phone (231-726-2253) so we can clarify the information and ensure accuracy. Yes, we do ask for full payment at the time of order. We started asking for pre-payment because of the amount of orders placed and never picked up. We ask for payment regardless of the quantity ordered. We accept all major credit cards, cash, checks, and EBT cash benefits. Click here for more information regarding EBT and deposits. During the holidays, graduation season, or for large orders, we love at least 2 weeks notice, but feel free to call and we’ll see how we can accommodate you if you need something sooner. For smaller orders during the “off season”, just let us know within a week to 48 hours prior to pick up and we’ll have your order ready for you! What if I need to change my order or cancel my cake? Changes to your order or cancellations will be honored at no charge up to one week prior (7 days) to the scheduled pick up date. If less than a week notice is given, there will be an additional charge for changes to design, cake sizes, or cancellations up to 50% of the original cost. Do you require a minimum order on bakery items? It depends on what you’re ordering. If it’s something we carry in the store on a regular basis, there are no minimum orders. If it’s for cupcakes, breads, rolls, or other products that are made to order or only carried during the holidays, minimum orders apply as we sell by the batch to minimize waste. Yes, we offer an $11 dozen doughnut deal all day, every day, and a quantity discount on our Homestyle cookies if purchasing 4 dozen or more. We are unable to offer quantity discounts on decorated products (cupcakes, pastries, decorated cookies, etc.) because of the time involved to make each one. My grandmother had a great recipe…can you make that? As much as we’d love to be able to accommodate every request that we get, our equipment is very large and when we bake anything, we are making 50 gallon batches; which is enough to make 100 cakes! We don’t have equipment at the bakery small enough to make a single cake. Can you put “pictures” on cakes? Yes, we can. Please give us one week to process your image. You are welcome to bring your image into the bakery or e-mail your image to info@rykes.com. If pulling images off the internet, keep in mind that we are subject to copyright law, so we’ll need written permission from the owner of that image to reproduce it for you on your cake. Any picture provided must be in JPEG format. I saw this cute Minnie Mouse cake online, can you make it for me? Because we are selling our cakes to you, we are bound by Copyright and Trademark Law. This means that any character that is trademarked, like Mickey Mouse and Minnie Mouse, college or company logos and most other characters from popular TV shows and movies are off limits for our bakery to reproduce unless we have written permission from the owner of the copyright or trademark. The reason you see them online is because many of these cakes are being produced by hobby bakers for their families and friends and are not being resold to the public. We are not allowed to make money from someone else’s intellectual property. We do, however, have a wide variety of “licensed” toys that we can put on your cake. We also have requested permission from many West Michigan High Schools and Colleges to reproduce their logos on our cakes. Please view our list of licensed kits and logos. If what you are looking for is not on our list, feel free to contact that company directly and request written permission. The permission and approved item in a .jpg format can be e-mailed to info@rykes.com. Please include your name and event date in the subject line of the e-mail. Do you make Sugar-Free or Gluten-Free baked goods or cakes? We do offer flourless cake options! Our flourless cakes are perfect for those with mild allergies or dietary restrictions. However, we are not a gluten-free certified bakery, so there is gluten in the air at our production facility. For those with severe allergies or celiac's we recommend exercising great caution. Sadly, we do not make any sugar-free products. We made an attempt, early on, but because we are equipped only for large batches, we had too much waste for the amount of products that were being requested. Do you use nuts in your products? Some of our products, like our carrot cake and sweet breads, do contain nuts and all of our baked goods are baked in the same kitchen and may not be suitable for individuals with nut allergies. We ask that all products are approved at pick up and due to the nature of our products, we cannot accept returns or issue refunds. However, we want all customers to be 100% satisfied with their Ryke’s Bakery experience. If for some reason you are dissatisfied, please contact the bakery within 24 hours of your purchase and we will do our best to address your concern. Can you make me an adult-themed cake for my bachelor/bachelorette party? There are too many kids runnin' around here! We choose to keep our cakes rated PG.